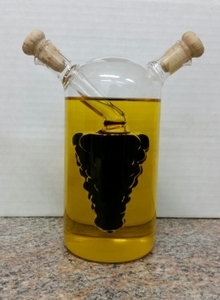 The grape cluster olive oil & vinegar cruet is hand blown by artisans in Europe. It makes a beautiful table piece that is elegant, durable and practical. The cruet is made of SIMAX glass which is the European equivalent of PYREX. Measures approximately 6 inches tall, to top of spouts. Olive oil and vinegar is not included so you can purchase your favorites from us!